The Army calls their enlisted jobs MOSs, or "Military Occupation Specialties." The Army has around 190 MOSs available for enlisted Soldiers. Similar specialties are divided into "branches" or "fields." Below are the Army enlisted job fields with the MOSs that fall under that branch. The MOS 09L is the foreign language interpreter/translator, and they are primarily responsible for interpreting and translating spoken and written foreign languages to English and English to a foreign language. The backbone of the Army is the infantry. The infantry is the main combat force on the ground, and they are responsible for fighting enemy ground forces on land. All the jobs of the infantry MOS work together to defeat the enemy ground troops and continue the mission of capturing, destroying, and repelling the enemy. Recruits enlist under the Army&apos;s 11X - Infantry Enlistment Option, and during training, will be designated as either MOS 11B, Infantryman, or MOS 11C, Indirect Fire Infantryman. 11B INFANTRYMAN: The 11B Infantrymen are riflemen who assist in the performance of reconnaissance operations, and employ, fire and recover anti-personnel and anti-tank mines. INDIRECT FIRE INFANTRYMAN: These soldiers perform some of the most dangerous jobs in the Army. They fire and recover anti-personnel and anti-tank mines, and locate and neutralize mines in live minefields. This MOS is also responsible for navigating between points on the ground, orienting maps, and operating and maintaining communications equipment. 11Z INFANTRY SENIOR SERGEANT This is open to soldiers in E8 (sergeant) and E9 (master sergeant). These soldiers lead infantry troops. CORPS OF ENGINEERS - The engineering community in the Army are diverse in skill, but are also trained in fighting and defending Army facilities. Together the Corps community can build anything and destroy anything as well. 12A ENGINEER SENIOR SERGEANT: These officers of the Corps of Engineers serve in a variety of engineering-related roles, including reconnaissance, demolitions, construction, rescue, and training. COMBAT ENGINEER: Also known as "Sappers," these soldiers supervise or assist team members when tackling rough terrain in combat situations. They&apos;re experts in mobility, counter-mobility, survival and general engineering. They build defenses to protect the troops or destroy obstacles in the way of combat troops movement, including mines and minefields. FIELD ARTILLERY - Field Artillery Soldiers operate a variety of electronics and communications platforms, as well as a variety of weapons systems and munitions. The main job of the Field Artillery MOS is to provide firepower during combat operations, as well as tactics, techniques, and procedures for the addition of all ground fire support systems in the Army arsenal. AIR DEFENSE ARTILLERY - The Air Defense MOS community are responsible for the operation and maintenance of weapons systems that thwart enemy long and short range missiles. The Patriot Batteries are constantly deployed to such areas of South Korea and Israel to challenge the threat of incoming enemy missiles. AVIATION - The officers and the soldiers of the Army Aviation community are responsible for the operation and maintenance of helicopters, planes, and unmanned aerial vehicles. Whether transportation of equipment or personnel or combat actions on enemy ground troops, the Army Aviation community increases the operational range of the Army soldier in combat. SPECIAL FORCES - The close-knit team of Army Special Forces members in this MOS community train allied troops and engage the enemy in special operations direct action missions around the world usually with little publicity of their actions. They earn and wear the Green Beret after the completion of their selection and qualifications courses. ARMOR - The Armor officers and crew conduct ground combat operations using armored vehicles as the M1 Abrams Tank and the Bradley Fighting Vehicle. Taking the fight to the enemy, the soldiers of the Armor MOS community use their tanks and cavalry/forward reconnaissance operations on the battlefield as the Army&apos;s long-range ground fighting force. SIGNAL CORPS - If the Infantry is the backbone of the Army, the Signal Corps is the spinal cord. 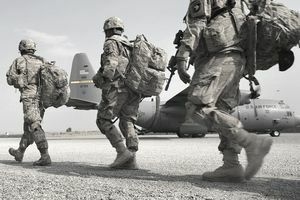 Secure communications between the soldier on the ground, helicopter over a combat zone, and the ground commanders is the important task of the signal corps. The gathering of enemy communications and translating and deciphering verbal or nonverbal communications is part of the signal corps specialty skills. MILITARY POLICE - Protecting the lives and property on Army installations is the job of the Military Police MOS community. They control traffic, help prevent crime, respond to emergencies on and off base as well as enforce the military laws and regulations. Military Police are also crime investigators with arrest authority. The Military Police MOS also get involved with detecting illegal behavior with police dogs and protect the base they are assigned with bomb-sniffing dogs as well. MILITARY INTELLIGENCE - The "Intel" Community are responsible for collecting, sharing vital information to combat soldiers concerning targeting, enemy manpower, and capabilities. Pictures, electronic, communications, human, and counterintelligence are methods used to collect information to save soldier&apos;s lives on the battlefield. PSYCHOLOGICAL OPERATIONS - "Psy Ops" are used to influence the local population not to join insurgencies and be a source of information to assist Army soldiers on the ground. Getting into the head of the enemy combatants and helping them to leave the battlefield would be a vital role of the Psychological Operations Specialists. CIVIL AFFAIRS - The Civil Affairs MOS are communicators, planners, coordinators with a variety of agencies to assist local population in combat zones. MEDICAL CMF - Army Healthcare system is supported by the highly trained men and women of the Medical Community MOS. From dentists, surgeons, laboratory technicians, to nurses and nutritionists, the Army Medical Staff is organized to be of assistance in combat zones and stateside hospitals. TRANSPORTATION - From Sea, Air, Rail, and Land, the Transportation Specialists operate and repair and maintain all transportation vehicles in the Army arsenal. COMBAT ELECTRONIC SYSTEMS REPAIR / MAINTENANCE - Maintaining and repairing highly technical combat electronic systems is the job of the 94 MOS Community. QUARTERMASTER CORPS - The logistics and life&apos;s blood of the soldier falls onto the shoulders of the members of the Quartermaster Corps. Providing soldiers with food, water, petroleum, repair parts and other services during any operation is the job of the MOS of the Quartermasters. What Do 91F - Small Arms/Artillery Repairers Do? What Does a Combat Documentation/Production Specialist (25V) Do?